Lychee Gallery is continuing with its policy of inquiring into ways in which painting presents a relationship to its own image within the experience of boundary. At first sight the presentation appears of the mixing of codes related to formal abstraction, figurative depiction and installation. Yet something coheres perhaps as the result of a yet deeper and less obvious schema existing within the framework of the work. This deeper and less obvious element belongs to the reality of a diagrammatics below either image or the geometrical abstraction thus sublating such difference. This diagrammatic element enables the play of the elements to occur within the space of the gestures that accrue. Thus the paintings cohere within their own deliberate spacing but they also drift into an elsewhere of space that is remote (or simply the beyond of representation). We are left with isolated glances, a head turned around, a face governed by hands, optical shapes functioning either as shadow or after images, all creating traces of departed indexes that once completed a scene. Yet despite the severity of the fragmentation process quite another scene appears, a constellation of pulsations of vision offered and withdrawn, colours resonating and spacing(s) tensing within the yield of space. In this work what is plain to see, what is in front of is also drawn close to what is obscure and difficult to see. All that might be claimed is a pleasure in overcoming contraries and so Lychee One is pleased in turn to present the play of difference and the play from within difference that the words accords as distribution of sense. born in WuHan, China. Now studying at, Royal College of Art, Fine Art Research Degree Show 2016, Royal College of Art, London .RCA Secret ,Royal College of Art, London, Dubai. Fluorescent 2015, Soho Open House Arts Festival,London Work-in-progress Show, Royal College of Art,London RCA Secret ,Royal College of Art,London 2014 Shortrlist Outstanding student works of the eight Institutes of Fine Arts in China(hosted by Oil painting branch Chinese Artists Association), ￼ He Xiangning Art Museum, Shenzhen, China 2012 Students’ Art Fair (Guangzhou, China). “FaSheng” —the group exhibition of four students from Oil Painting department. (Wuhan , Hubei , China) 2011 Shortlisted “ Declaration of Independence“ – Today Art Museum “Giant Cup” 2011 Contemporary Art Students’ Annual Awards, (Beijing, China). Much of her recent work attempts fragments of images that open out a relationship of a absent ground. 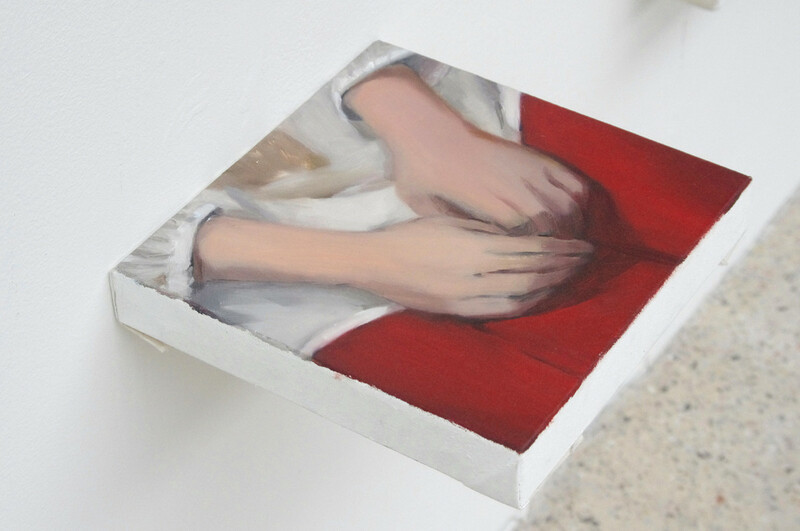 A painting should be on the ground,or the painting leans on the wall and so on. This suggests a spatial poetics of the image in which something is missing. Do this implies she is researching something that is not there or cannot be represented? What is the relationship between the image and space? The difference not only to provide the meshed system upon which other figural, representational arrangements and their social organization take form but also to discuss a space of painting , it’s important to Yifei. Her paintings discuss such a space of painting from image and language of respective codes. She uses her practice to open the gap between what can be presented on the aesthetic plane and what is opened by conceptual configuration. precisely embedded within an absence of representation in social structures within a larger physical and social field.